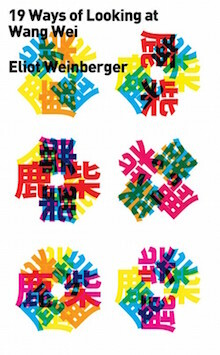 Eliot Weinberger takes big strides across literary history in his genuinely breathtaking short work, 19 Ways of Looking at Wang Wei, tracking translations of a short ancient Chinese poem from the publication of Ezra Pound’s Cathay in 1915 to Gary Snyder’s translations in the late ’70s. This new edition from New Directions Publishing includes an addition Weinberger wrote this past year, covering more recent efforts by sinologists in the twenty-first century in English, French, and German. Weinberger makes short work of the early twentieth-century practices of versifying the poems, rendering them in eloquent nineteenth-century language, and “improving” the original with unwarranted additions. Most of the translations reviewed are torn to bits in the space of a few paragraphs, or less. For instance, his evaluation of Liu’s 1962 verse translation: “. . . the first two lines heave, the third gasps, and the fourth falls with a thud on the rhyming mossy ground.” Weinberger tears apart “the corset of traditional verse forms,” allowing the very intentional style of the Chinese to show itself. But he also turns an equally sharp and penetrating critical eye to more modern attempts. He is attentive enough to the imagery to point out, for example, that a fair few recent translators have rendered the poem inaccurately by imagining the wrong species of the moss in the fourth line. A single word—such as zhao, “reflected,” or shang, “above”—is refracted between poems through the whole study, its varying English glosses held up against the image constructed by Wang’s original. The reader thus spends most of the book in Wang’s place, standing in the empty mountains, straining to hear the faint echoes of the original, and analyzing each translation as though examining a patch of moss from different angles in the light of the setting sun. Weinberger easily grasps, over the course of this history, the essential elements of Wang Wei’s original poem: namely, the long-established Chinese propensity for parallelism, and the Buddhist idea of emptiness. Not very difficult to take cognizance of, but equally easy to miss; and those who do miss it are rightly panned as unfaithful to the original. For anyone with some Chinese reading ability, it is shockingly, visibly apparent which translations are close to the original and which aren’t, which is part of what makes this work so powerful and persuasive. It becomes clear that it is American modernism, characterized by “absolute precision, concision, and the use of everyday speech,” which is best suited to classical Chinese poetry in its deliberate simplicity. Hence the success of the translations of Burton Watson and Snyder (above), the tacit “winners” of Weinberger’s wide-ranging judgment. Ever conscious of the Buddhist thrust of Wang’s poem, Weinberger turns out a very Buddhist conclusion: “translation is dependent on the dissolution of the translator’s ego.” This work is surely the manifesto of the modern—silent—translator.